Perry Fewell Joins Redskins as Defensive Backs Coach: Perry Fewell, the former defensive coordinator of the New York Giants who was fired by the team on January 7th, has joined the Washington Redskins as their new defensive backs coach. Ironically, Fewell replaces Raheem Morris, who interviewed with the Giants for the defensive coordinator vacancy before the Giants hired Steve Spagnuolo. Fewell had also interviewed with the San Francisco 49ers, who reportedly offered him a position as their defensive backs coach. 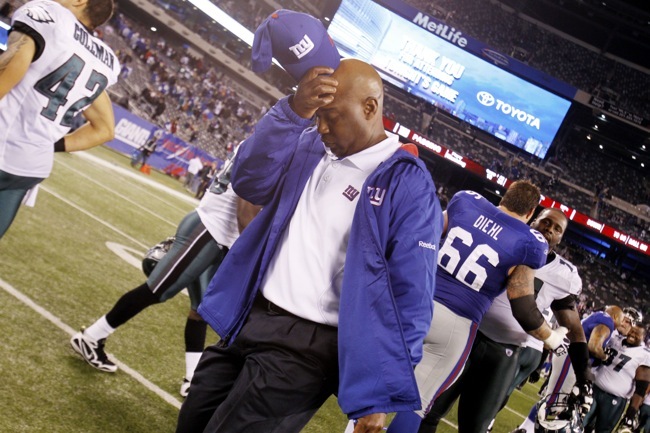 Giants Fire Perry Fewell and Peter Giunta: The New York Giants have officially announced that they have fired Defensive Coordinator Perry Fewell and Cornerbacks Coach Peter Giunta. Fewell had been the team’s defensive coordinator since 2010 and Giunta the cornerbacks coach since 2006. 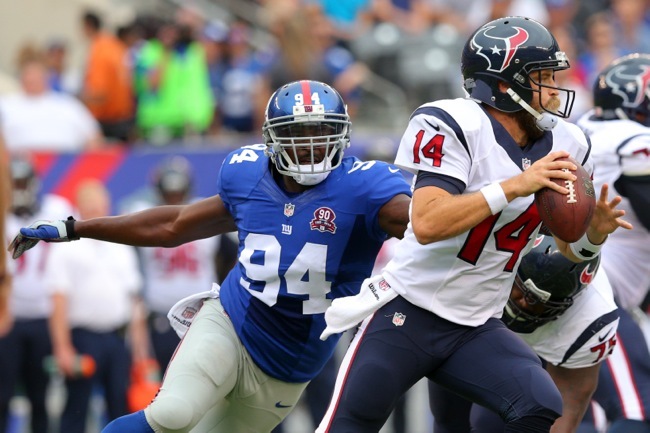 The Giants finished 29th on defense in 2014 in terms of yards allowed. In other seasons under Fewell, the defense finished 7th (2010), 27th (2011), 31st (2012), and 8th (2013). “These are two outstanding men and outstanding football coaches,” Head Coach Tom Coughlin said in a press release. “It is very hard in this business to find people that are not only good football coaches but outstanding human beings who are trustworthy, loyal and honest. Perry and Peter are all that. “No one person is responsible for what happened in this year. That has to be loud and clear. If there is any one person responsible, it is me. It is not Perry Fewell. It is not Peter Giunta. Both of them are outstanding football coaches in their own way. The simple fact of the matter is in the circumstance that we find ourselves, change is necessary. That may not be the most eloquent way of saying it, but that is what I am confronted with. The hope always is invigoration. You are going to stimulate. It is with great deliberation over a lengthy period of time throughout a thorough investigation and evaluation of what went on that I came to the conclusion that change was necessary. “There are no hard feelings on my part about anything that anybody has done. The hard feelings are the six wins. That is the reality. It is unfortunate, but it is true. For a complete listing of the Giants current coaching staff, see the New York Giants Coaching Staff section of the website. Best of 2014 Sights and Sounds Video: Giants.com has produced a “Best of 2014” sights and sounds video. 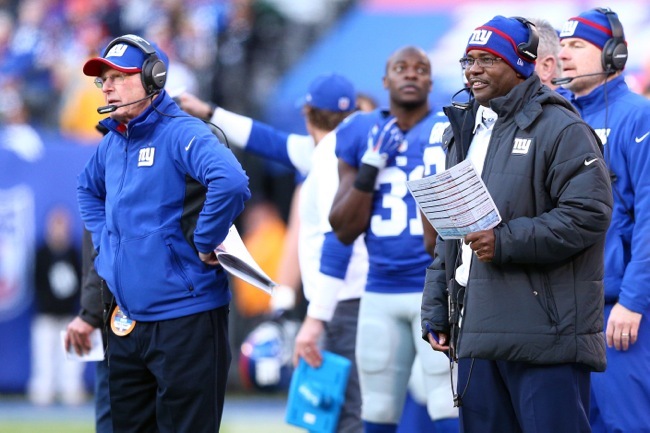 According to Newsday and The New York Daily News, New York Giants Defensive Coordinator Perry Fewell and Special Teams Coordinator Tom Quinn will likely retain their positions with the team for the 2015 NFL season. Meanwhile, The New York Daily News says two sources have told the paper “it appears (Fewell and Quinn) are coming back.” Like Newsday, The Daily News is reporting that any coaching staff changes will not likely involve the coordinators. According to one team source, in Coughlin’s meetings last week with GM Jerry Reese, co-owner John Mara and others in the organization, the idea of firing Fewell came up and some in management wanted that to happen. 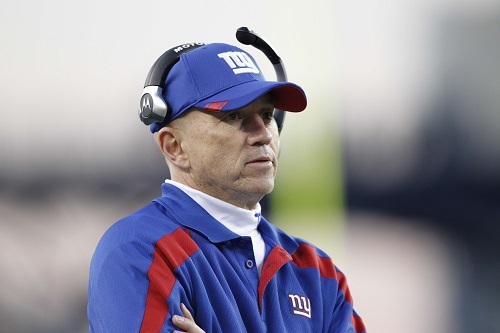 Some in the organization had held out hope that Coughlin would turn back to Steve Spagnuolo, his defensive coordinator in 2007-08, who is now the defensive backs coach for the Baltimore Ravens. Fewell’s defenses have ranked near the bottom of the NFL three of the past four seasons (29th in 2014) and Quinn’s special teams units have been far from special for years. To date, the only changes to the coaching staff have involved the quarterbacks coach position. Danny Langsdorf, who joined the Giants in January 2014, is returning to the collegiate ranks to become the University of Nebraska’s offensive coordinator. He is being replaced by Mike Sullivan, who was the team’s quarterback coach in 2010-11. 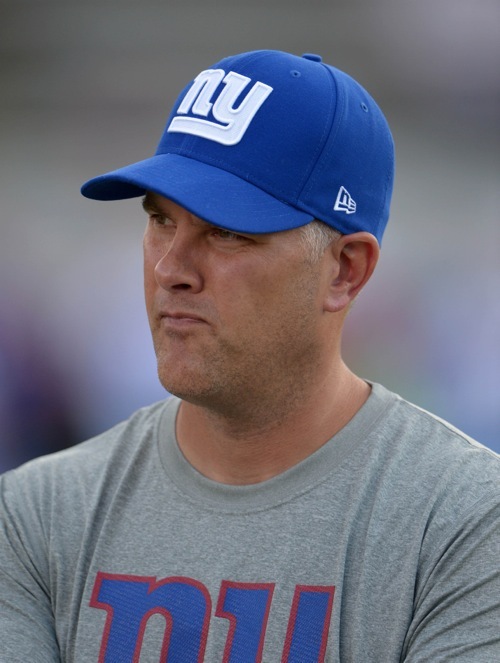 New York Giants Quarterbacks Coach Danny Langsdorf is leaving the team in order to become the offensive coordinator at the University of Nebraska. Langsdorf joined the Giants’ coaching staff in January 2014 when Sean Ryan was demoted to wide receivers coach. Langdorf had been the offensive coordinator and quarterbacks coach at Oregon State University from 2005-2013. Under Langdorf’s tutelage, quarterback Eli Manning had one of the best seasons in his career. Manning finished the season with 4,410 yards (second-highest total in franchise history), 30 touchdowns (one shy of his career-high in 2011), and 14 interceptions (13 fewer than he threw in 2013). Manning’s completion percentage (63.1) was a career-high. His passer rating of 92.1 was the second-highest of highest of his career (93.1 in 2009). For a complete listing of the current Giants coaching staff, see the New York Giants Coaching Staff section of the website. QB Eli Manning on WFAN Radio: The audio of Monday’s WFAN Radio interview with QB Eli Manning is available at CBS New York. Sights and Sounds from Giants-Eagles Game: A sights and sounds video from the Giants-Eagles game is available at Giants.com. Jerry Reese and Tom Coughlin to Return, But Some Assistants Might Not: According to The New York Daily News and The New York Post, Jerry Reese will not be fired by team ownership and will return as general manager of the New York Giants for the 9th season. In addition, according to ESPN, The Bergen Record, and The New York Post, Tom Coughlin will not be fired and will return as head coach of the Giants for the 12th season. ESPN is also reporting that Coughlin will meet with team President/CEO John Mara at 3:00PM on Monday to discuss potential coaching staff changes. Unconfirmed BigBlueInteractive.com sources have said that Defensive Coordinator Perry Fewell and Special Teams Coordinator Tom Quinn will be let go. December 26, 2014 New York Giants Injury Report: LB Devon Kennard (toe) did not practice on Friday. He has officially been ruled out of the regular-season finale against the Philadelphia Eagles on Sunday. Giants Online – Giants vs. Eagles Preview: The video of this week’s Giants Online is available at Giants.com. December 18, 2014 New York Giants Injury Report: RB Rashad Jennings (ankle) did not practice on Thursday. LB Jameel McClain (knee) fully practiced. 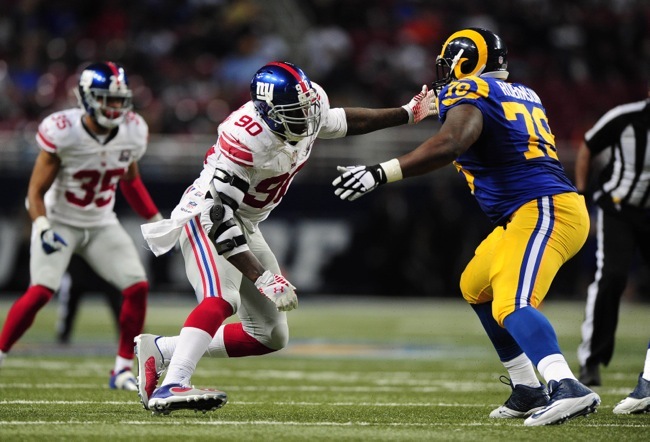 Giants Online – Giants vs. Rams Preview: The video of this week’s Giants Online is available at Giants.com. December 11, 2014 New York Giants Injury Report: OT James Brewer (concussion) and LB Jacquian Williams (concussion) did not practice on Thursday. QB Eli Manning (back) practiced officially on a limited basis. LB Jameel McClain (knee) and LB Mark Herzlich (concussion) fully practiced. Giants Online – Giants vs. Redskins Preview: The video of this week’s Giants Online is available at Giants.com. Odell Beckham Wins NFL Offensive Rookie of the Month Honors: New York Giants wide receiver Odell Beckham, Jr. has won “NFL Offensive Rookie of the Month” honors for his performance during the month of November 2014. 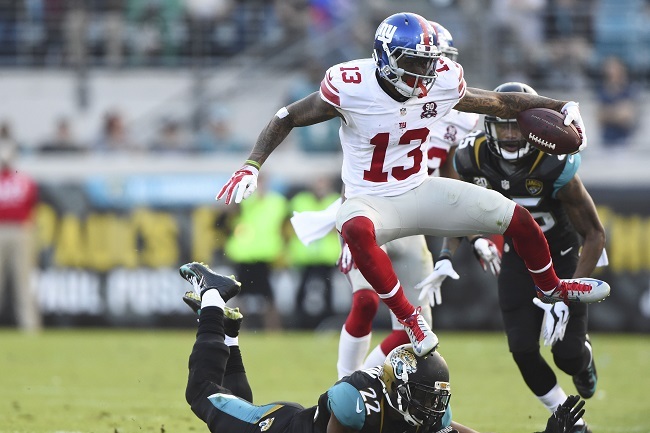 Last month, in five games, Beckham caught 38 passes for 593 yards and two touchdowns. The last and only other Giants wide receiver to win NFL Offensive Rookie of the Month honors was Hakeem Nicks in October 2009. December 4, 2014 New York Giants Injury Report: RB Rashad Jennings (ankle), OT James Brewer (concussion), LB Jacquian Williams (concussion/shoulder), and LB Mark Herzlich (concussion) did not practice on Thursday. WR Preston Parker (knee), DT Cullen Jenkins (calf), LB Jameel McClain (knee), and CB Dominique Rodgers-Cromartie (back/shoulder) practiced on a limited basis. OT Justin Pugh (quadriceps) fully practiced. Giants Online – Giants vs. Titans Preview: The video of this week’s Giants Online is available at Giants.com. Mathias Kiwanuka Will Not Play Against Jaguars: New York Giants defensive end Mathias Kiwanuka (knee), who was originally listed as “questionable” on Friday for Sunday’s game against the Jacksonville Jaguars, did not make the trip to Jacksonville and his status has been downgraded to “out.” Robert Ayers will start at left defensive end for Kiwanuka. Damontre Moore is likely to see his workload also dramatically increase. DT Cullen Jenkins (calf), LB Jacquian Williams (concussion/shoulder), and OG Adam Snyder (knee) were ruled out of the game on Friday. OT Justin Pugh (quadriceps), who is questionable, did make the trip but he is not expected to start at right tackle on Sunday. Geoff Schwartz is expected to start at that position for the second week in a row with Weston Richburg regaining his starting position at left guard with Snyder out.